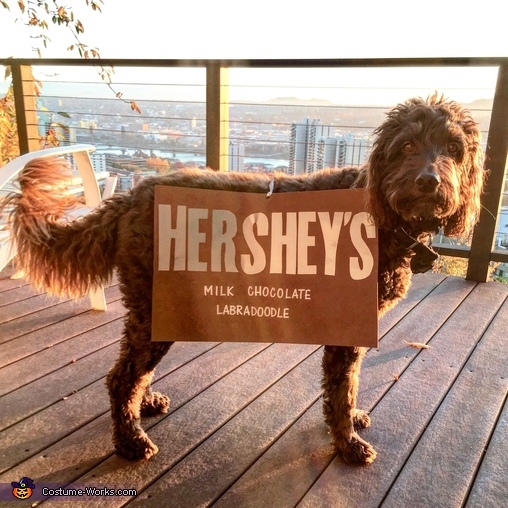 I made my dog a Hershey's chocolate bar costume. He is chocolatey brown and his name is Hershey so I thought it was a very fitting costume choice. I bought all the materials at the craft store Michael's. The costume required two brown foam rectangles (sold in that size), three 12x12 sheets of silver sticker paper to cut out "HERSHEY'S" twice (one for each side), 2 packs of white alphabet stickers to write out "MILK CHOCOLATE LABRADOODLE" twice, and a wire ribbon to connect the two foam rectangles on each side of him. I printed the "HERSHEY'S" letters the size I wanted them, cut them out, traced them onto the sticker paper, cut those letters out, and stuck them onto the foam. I then used the white alphabet stickers to write "MILK CHOCOLATE LABRADOODLE" underneath. I poked holes at the top of each foam piece and strung a silver wire ribbon through and tightened as needed so that the costume would hang well. It took about three hours to complete and the total cost was about $18. The second picture is of me and Hershey. I was a Hershey's kiss so I could match my boy. I bought the silver dress at Forever 21 and my friend helped me make the hat (she was a kiss too). To make the hat, she cut off a long strip from a white pillow case and used blue puffy paint to write KISSES on it. She then wrapped a party hat in tin foil, and hot glued the white pillow case strip onto the top of the hat. We had all these materials but if you were to buy them, they'd cost about $10 (excluding the hot glue gun). Our costumes were as sweet as can be and we hope they make you smile! !